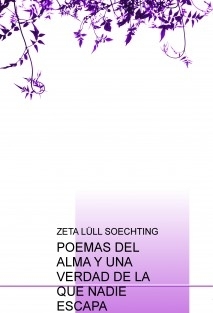 ES UN LIBRO DE POEMAS SENCILLOS PERO CON LA PROFUNDIDAD DEL ALMA. ¿QUE OCURRIRA CON EL MUNDO SI SE ACABAN LOS POETAS ¿O EL ROMANTICISMO PURO QUE HACE AL ALMA INMORTAL ¿QUE CON LOS ENAMORADOS Y SU IDIOMA UNIVERSAL ¡QUE DIOS NOS TENGA PIEDAD Y CONSERVAR NUESTRA CALMA, QUE SIEMPRE HAYA UNA VERDAD DE LA QUE NADIE ESCAPA Y LOS POEMAS DEL ALMA! DIOS LOS BENDIGA.